The most famous square on the island of Capri, Piazza Umberto is a small square that encompasses the spirit and beauty of Capri in it. Dominated by a bell tower, this square is surrounded by shops and restaurants. It is located in the old town of Capri and acts as a meeting point for the islanders. 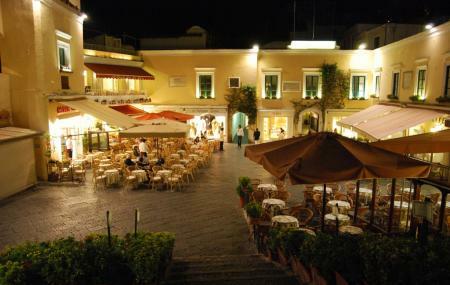 This is a great place for people watching and seeping in the history of Capri. There are a number of inscriptions that surround the square. How popular is Piazza Umberto I? People normally club together Gardens Of Augustus and Gelateria Pasticceria Buonocore while planning their visit to Piazza Umberto I. Grab a seat in this lovely little square and have a drink and watch world pass bye. Just remember to bring your wallet, whoa, good reason why Capri is known as millionaires playground! Beautiful island. My favorite part of a week-long cruise. Careful of the indoor turbo ferry on the way there if you have a weak stomach, so much vomit. Top board speed boat on the way back was beautiful, relaxing, with great views. A classic for the local people, this place holds a lot of childhood memories, it's always a pleasure to go back when possible. Very pretty location lots of people. Presently there's a small child holding up a large elephant an art display. Lots of high-end shops on the road. Real tourist attraction but great views.